CSC – Combined Stick Commands – are used to start (and one way to stop) the Phantom motors. A CSC requires the movement of both sticks into a certain position…such a move generally eliminates the possibility of accidentally starting or stopping the motors. In most normal operation, a CSC is used to start the motors before flight – and a simple “throttle down” command is used to stop them. The “throttle down” motor stop only works when the Phantom has already landed (or been hand caught) and is activated by holding the left stick against the bottom (6 o’clock position) for a few seconds. Don’t be concerned about accidentally shutting the motors off this way in flight by holding the throttle down – they will only turn off if the Phantom is stationary. 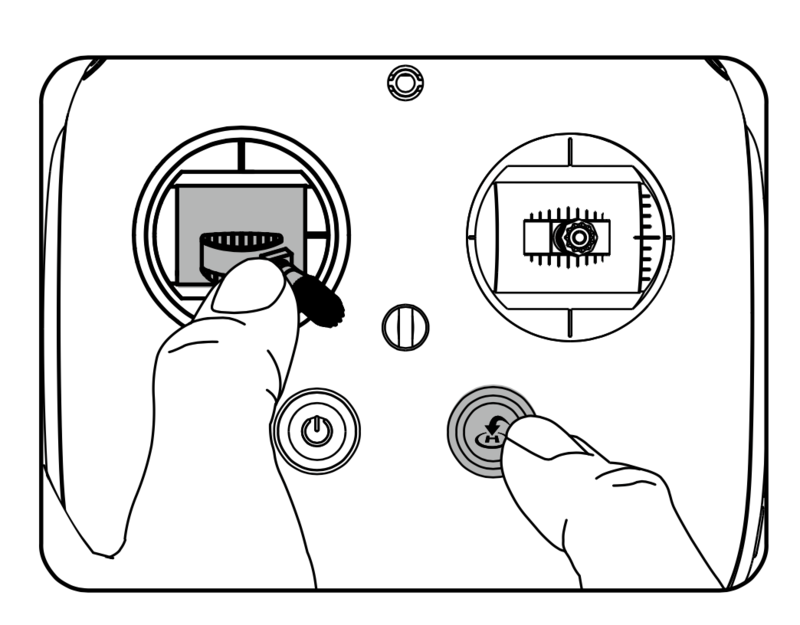 Please check a current copy of your owner’s manual for the most current CSC setup and practice both the CSC as well as normal “throttle down” motor stop. At the time of this writing, the setup of the Phantom 3 and Phantom 4 are slightly different. A CSC on a Phantom 3 will turn off (or on) the motors whether the Phantom is flying or not! This is a feature which exists for emergency use – for example, if you see your Phantom drifting toward a large highway and you want to make it drop out of the air (with the possible crash/loss), you’d execute this command. On the Phantom 4, the CSC only works when the Phantom is stationary. There is a different sequence which makes it “drop out of the sky” described as follows and pictured below. Hold the right stick (throttle) at the bottom right and press the “H” hardware button on the Remote (the rightmost round button below the sticks). Once you have confirmed all systems are go, arm the motors by pulling both control sticks in and toward the bottom (as per diagrams, any of these sequences will work) – let go as soon as the motors start. The motors will execute a few short bursts of speed – not enough to lift the aircraft, but it is likely to startle you if you are not prepared. These are startup bursts and designed both to inform you that all systems are go – and also to help tighten the propellers in case they were installed loosely. If you get nervous and don’t move the sticks after this sequence, the motors may turn off again. Don’t fret – simply go through the motions again and this time apply a bit of throttle (left stick up) after the motors have started. NOTE: If status LEDs are doing something other than what is expected (green), do not fly your Phantom! Try re-calibrating the compass and then a new startup to fix the problem. If they do not correct the LED error, consult your owners manual and/or dealer. Phantoms are very reliable aircraft, but as with any complicated technology, things can and do go wrong. You may remember what each of the remote “stick” controls from the previous descriptions, but here is a refresher so that you know your basics before you take off. 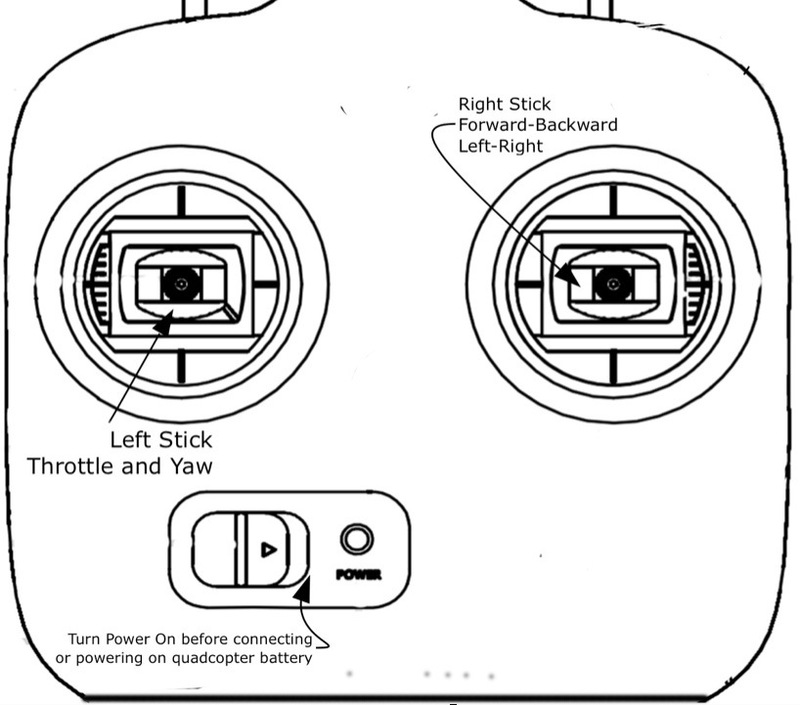 The DJI Transmitter has two sticks – a left and a right. Both sticks use springs to hold the sticks in the center. The left stick serves two functions – it’s the throttle to lift the craft higher (spin props faster) by pushing forwards, and conversely you can make the craft descend by pushing down on the stick. The same stick when pushed left or right provides yaw, which in the case of a quadcopter means spinning it on its axis – that is, pointing the nose in a different direction. The right stick is more natural – pushing it forwards makes the Phantom lean and then move forwards – pulling it back makes the quad come back. Left and right make the quadcopter lean in those directions and therefore also move left-right. Start all your flights with a fully charged battery. If your Phantom is new it will automatically be in beginner mode which will limit how high and how far you can fly. You can turn this off later and set your own maximums. Your Remote3-way mode switch should be in P (positioning) mode – this is all the way to the right on all models except the P3S, where it is the right switch in the upper position. Your initial flights will go better if the wind is relatively calm – anything under 10 MPH should be fine, especially if you keep the Phantom relatively close to the ground. Perform the CSC to start the motors. The Phantom 3 will execute a small burst of power which is designed to make sure the propellers are on tightly. Advance the throttle forward and the propellers will slowly build up speed – don’t be shy because the Flight Controller (F/C) moderates the initial takeoff acceleration. You can give it quite a bit of throttle and then, when it’s a few feet off the ground, let the throttle spring back to center. A good height for your initial test is about eye level, so try to hover at about five feet off the ground. If you are in GPS mode (and you should be! ), the Phantom will stay fairly stable and only drift a few feet in any direction. Once you are satisfied that the quad is stable, get the feel of the throttle by raising the aircraft up a couple more feet – and then back down. Now it’s time to actually fly. Push forward slowly on the right stick and the Phantom should start moving away from you in the direction the nose was pointed. Pull back on the same stick and it will return toward you. Move the same stick a little to the right – and then to the left – and you will see your Phantom slowly roll in those directions. Each time you let go of the control sticks, the Phantom will self-level. This is called 6 axis stabilization and makes both flying and photography much easier. Once you have the basic feel of controlling the craft, lift up to 15-20 feet high – high enough that the LEDs on the Phantom’s arms become clearly visible. This will help you with orientation as you learn. Remember, the solid red LEDs are the front of the quadcopter while the green are in the rear. During your first flights, try to keep the Phantom no further than 50 feet from you and no higher than 20-25 feet. This will assure that you don’t get into trouble or chance losing it in a tree or over some nearby houses. The idea now is to build stick time and muscle memory so that the feel of the controls comes natural. The Phantom works differently than most quadcopters in that it features a centered throttle. Once your Phantom is in the air, let go of the throttle and the stick will spring to the center – while the Phantom hovers at the height you left it at. The ability to go hands off and have the Phantom maintain its position makes it much easier to fly and to concentrate on other actions such as photography. 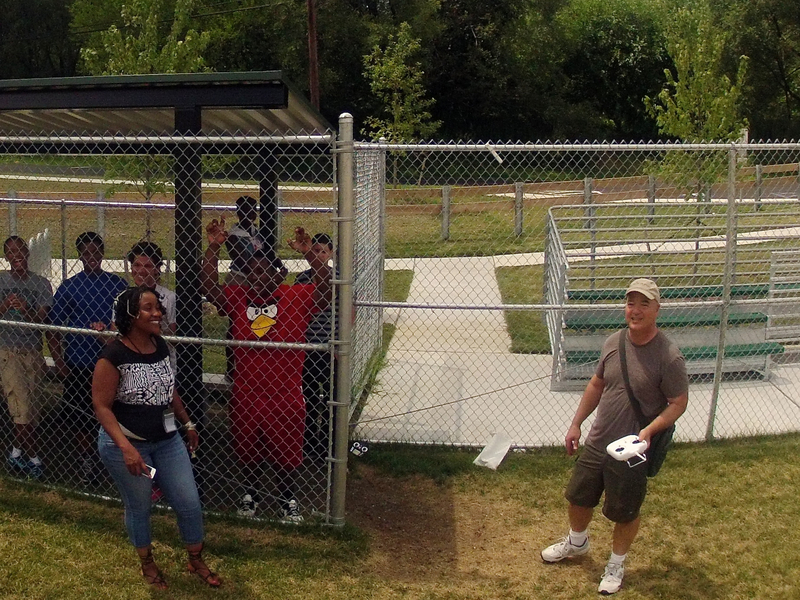 Note in the picture below, the Phantom took a picture of our drone camp – but I have no hands on the transmitter sticks. No Hands! Phantom will hover when the sticks are released. Your first 1/2 hour or so of flight should consist of simply moving the Phantom forward, backwards, left and right – with you standing behind the craft. This is a simpler orientation which feels natural to most flyers. Your stick movements during this practice will be mostly with the right stick – forward, backwards, left and right. You may have to give it some small bursts of throttle (left stick upwards) just to make sure it stays far enough in the air. Once you feel that you have some control, you can try using the yaw (spin) control, which is moving the throttle stick (left stick) left or right. This motion will make the Phantom spin in place on its center axis – in other words, it will point the quadcopter in a different direction. Your Phantom has some intelligence built into the flight controller so it will not simply run low on battery and fall out the sky. The P3 models have multiple warnings including the flashing of the status LED’s under the rear arms and warnings on the app. During your first 10 flights you’ll want to condition the battery by only discharging to 45-50%. This will assure a longer life and more power from your Phantom smart battery. It will also assure you that your Phantom will not automatically enter into an emergency mode and RTH (Return to Home) on its own. Low battery warnings and actions can be changed in the “Battery” settings screen of the DJI Go App. If the Phantom goes into RTH mode and you want to regain manual control, hit the RTH button on your Remote once – that should then disable the current Return to Home activity. There is much more information of the RTH (Return to Home – Failsafe) in the following pages and in the owners manual on your particular model. Landing is best accomplished by hovering a few feet high over level and soft ground and then slowly lowering the throttle until the legs touch down. Holding the throttle down for a few more seconds should stop the motors – or, if you wish to stop them quicker, perform the same dual stick sequence as you did to arm the motors on startup. The new Phantoms features automatic landing and takeoff with the press of a button on the app- however, it’s best to learn how the Phantom operates by actually flying it. IMPORTANT: Turn off the Phantom smart battery before turning off your Remote. Failure to do so may cause the Phantom to go into RTH (Return to Home) mode and take off without your consent! Orientation – it’s easy to fly the Phantom when it faces the same direction as you do – but when it’s facing you or another direction, the sticks will work differently – often in the opposite way as previously! Practice these moves so that you become more confident in your ability to control the craft no matter what the direction of flight. Banking – many pilots find that learning how to fly loops or figure 8’s is very instructive, as you can practice using both sticks at once. Spacial awareness – it’s important to get a grasp on distances, directions, compass headings as well as wind and weather. Just as sailors and pilots know these things, so should anyone piloting a Phantom. The Phantom models will display altitude as well as the distance from you on the DJI GO App. These quadcopters are not toys. Rather they are small aircraft and piloting them requires a skill set. The good news is that most anyone can learn these basics and, added to common sense, they will provide a good introduction to flying your Phantom.